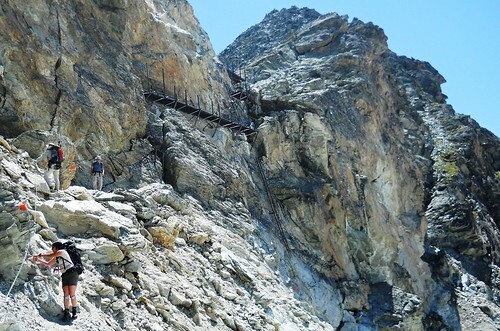 We flew out to Geneva, got the train to Sion and then a bus up to Arolla for the lovely walk up to the Pas de Chèvres ladders (now much improved since our last visit). 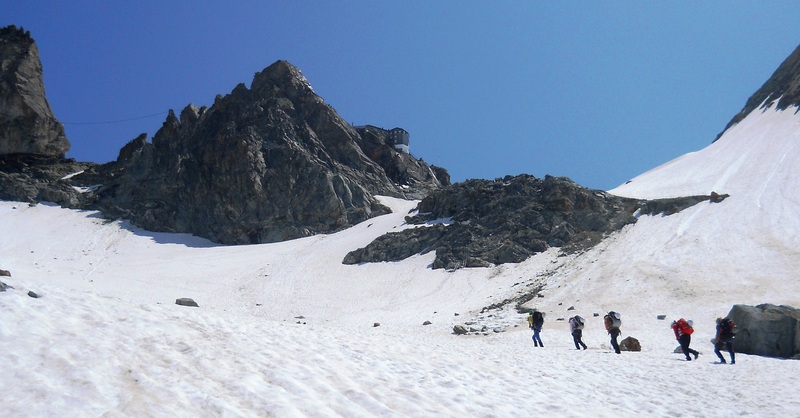 A short loose scree descent onto the dry glacier and up to the fantastic Dix hut. We spent our first day acclimatising by walking over the glaciated Col de Cheilon (3237m) to Col du Mont Rouge (3325m) and back. We also did some skills practice: belaying and abseiling en route. We got an early start to climb the easy La Luette peak from the Dix hut for further acclimatisation and glacier skills refreshment. Due to the unseasonal heatwave, we chose to get a 4.00am breakfast for an early start on our first proper stage of the Haute Route. 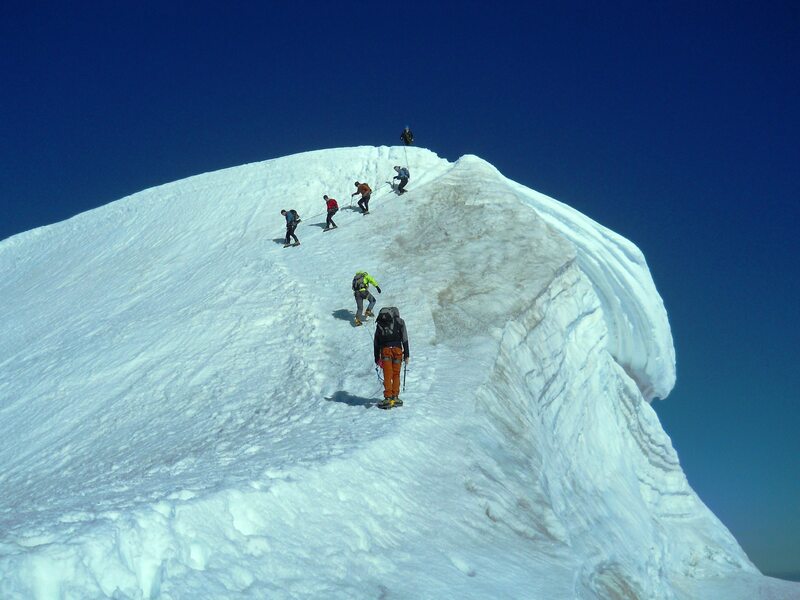 Taking turns with Étienne the Guide, we kicked steps up the steep soft glacier. The ascent of Pigne d’Arolla was fantastic and the views spectacular. The improbable Vignettes hut perches precariously off the side of a cliff and is accessed by an airy snow ridge. A beautiful but long day briefly crossing the Italian border twice on glaciers as we went over the Col de l’Évêque and down the Arolla Glacier. The Bertol Hut proved to be even more improbable than the last, teetering high upon a sharp rock arrêté requiring a multi-laddered ascent. Descending the Bertol ladders in the dark for another early start, we crossed the Glacier du Mont Mine and climbed up to the Tete Blanche summit with stunning views of the Matterhorn, Dent d’Herens and Dent Blanche. 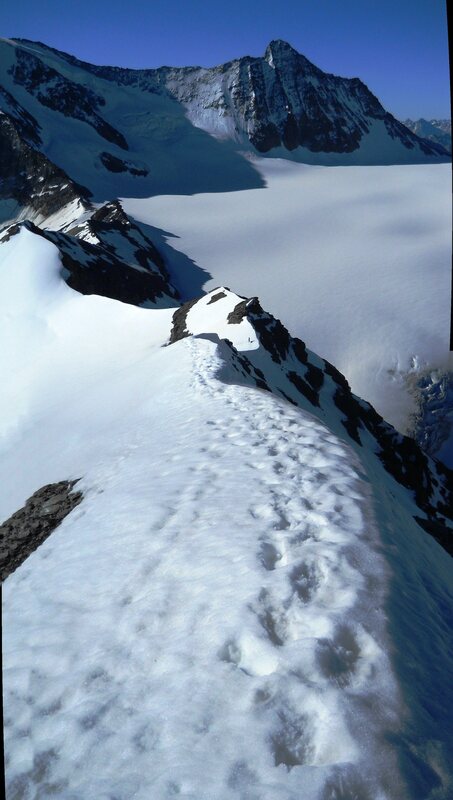 The descent of the Stockjigletscher glacier was straightforward due to lots of snow covering the crevasses. Getting off the moraine at the base of the Stockji proved a little tricky due to the snow, requiring a short abseil. The final signed route to the Schonbiel Hut was a terrible mess of loose scree, boulders and piss-poor waymarking – we’d suggest you don’t follow the new signed path (North) across the dry Schonbiel glacier, but continue down the Zmutt valley (East) towards Zermatt for a bit and ascend the nice stable path up the moraine from there. Our glacier Haute Route was completed by a half-day stroll down easy paths into the hustle and bustle of Zermatt. Here we based ourselves for 3 nights in a self-catering apartment and used the services of a local launderette and the supermarkets to great effect. We bought a two day lift pass and ascended the Sunnegga/Rothorn lift to Unter-rothorn. From there we had a nice half rest day climbing the Oberrothorn for fantastic views of the 38 local 4000+m peaks. An early start for the first lift up Trockner Steg to the Klein Matterhorn lift station to revisit the easiest of the 4000m peaks: the Breithorn. We also spent an hour or so watching the film shows in the highest cinema too for a bit of additional acclimatisation. An actual rest day: We hopped on a train to Sierre, and then caught the bus back up to Zinal and didn’t walk anywhere at all – nice! 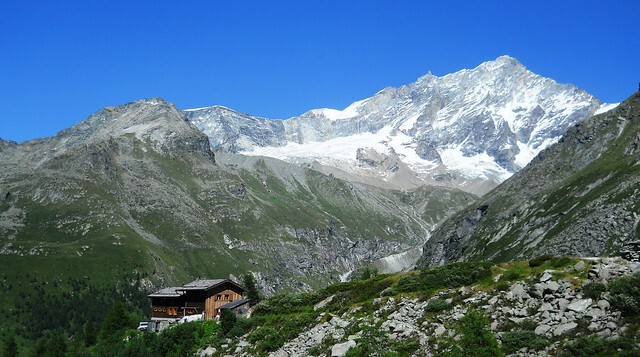 From Zinal we walked up to the Grand Mountet Hut. A surprisingly tough ascent over quite a distance, but lots of pretty flowers along the way. We took another 4.00am start to ascend the Trifthorn. The bergschrund crevasse at 3500m was however too wide and too steep for our liking, so we sacked it off – even so the views were terrific. On our return to the Hut for second breakfast we met a visiting helicopter dropping off supplies and then we continued down to the Petit Mountet Hut. From the Petit Mountet we crossed the valley and ascended the far side, passing the “Roc de la Vache” and up to the Tracuit Hut. 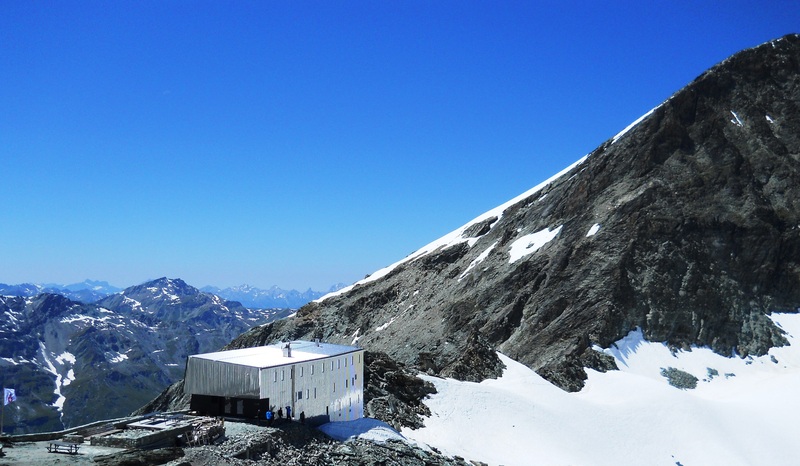 The hut has been completely rebuilt since our last visit, and is a lovely modern building (shame it still has only 4 toilets for over 100 people). Doing the Bishorn on a weekend should generally be avoided as it is VERY popular. However we couldn’t avoid it, so instead we got up a bit earlier than everyone else, and were a bit more efficient in getting ready so we were one of the first groups out straight after breakfast. The ascent is an easy snow plod avoiding some significant crevasses, the only minor difficulty is the last 50m or so on an exposed icy ridge to the summit. We then had second breakfast in the hut before the long descent back to Zinal.